Thankfully, I’ve learned to ignore the useless beliefs that “iron fists fuel learning.” I’ve come to realize—through practical experience and nerd-fest researching—that we should be giving teachers the opposite advice: Don’t stop smiling . . . ever. Primates expose their teeth as a defense mechanism—flashing teeth at foes. Perhaps this is where curmudgeonly teachers get their poor advice about not smiling. Good thing we are beyond our baboon beginnings. For those of us who ascribe ourselves as “human,” smiling is an expression of social safety. It signifies that we are not a threat, that we are approachable, and that we wish to share positive emotion. If any of these ideas—safety, approachability, positive emotion—do not belong in the classroom, then, by all means, don’t smile. 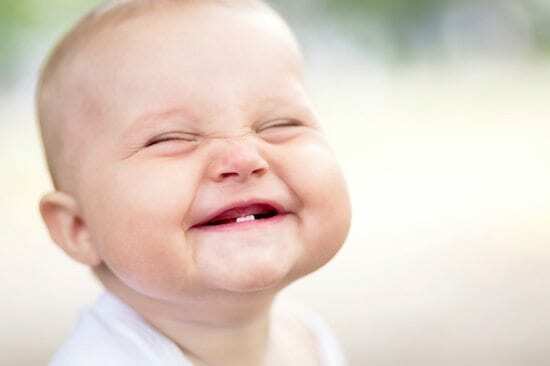 There is ample research on the positive effects, internally and externally, of smiling often. Ron Gutman provides an engaging and informative summary of smiling benefits for those who love a good TED talk. Imagine you are scanning the brain of an adult as he or she sees a picture of a neutral facial expression. The part of the brain you would see light up would be the frontal lobe—our rational thought center. We are, in a sense, logically analyzing if this face is happy, sad, angry, etc. Compare this to the brain scan of a teenager looking at the same photo. Which areas of the brain light up? The limbic system—in particular the amygdala which is processes emotion and perceives threat. In other words, teenagers are more likely to read neutral expressions or tones as threatening. Worse yet is that when one is sleep deprived, this effect is strengthened. Read: You think you’re being normal and neutral. Sleepy teen thinks you’re being a jerk-hole. The simplest solution: Smile more. Theorized by good ol’ Charles Darwin, FFR suggests that cueing a certain facial expression can activate the feeling of that emotion. Some studies have shown legitimacy in the idea: Suppression or expression of facial cues affects how we feel and respond. We can fake it until we make it—or better yet, fake it until we become it as Amy Cuddy suggests about nonverbal influence. Think about the power of this small idea. We can intentionally counteract sourness syndrome. Smiling, then, can not only affect our students; it can create a better experience for us as teachers. Joyful teachers = joyful teaching = joyful learning. Some link this idea to the concept of mirroring—the process by which humans build rapport and mimic one another’s nonverbal cues. By smiling, we make it more challenging for our students to be a bunch of angsty grumps. (Now, this doesn’t mean jumping around with exaggerated grins—doing so will just tick your kids off even more. A simple smile will do, please). Do we want students to see us as knowledgeable and competent? Yes. Do we want students to trust us and see that we are sincere in our intentions to educate them? Yes. Do we want to build rapport and have strong social trust in the classroom? Yes. All of these are beneficial for learning and management, and all of them can be increased by smiling. A joyful default can make management easier. 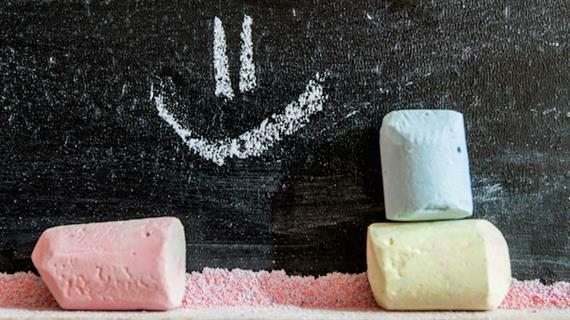 The idea that smiling helps classroom management runs counter to the horrid advice to “not smile until Christmas.” However, picture yourself as a student. 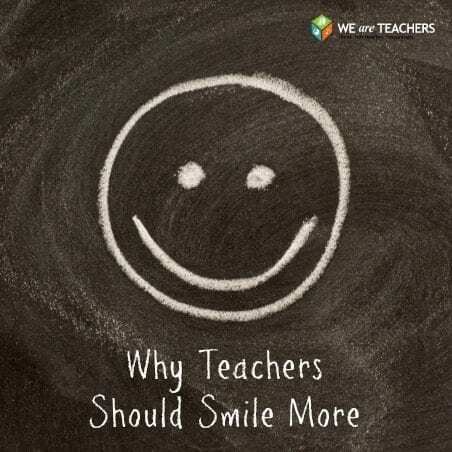 You have a teacher who smiles often (even if Ms. Grins is faking it). Then, after you and your classmates get a little unruly, that smile ceases immediately. Before the teacher even says a word, your brain has been cued to recognize the behavior as socially unacceptable. Your developing brain is improving its ability to read emotional responses. Compare this to a classroom in which the teacher normally scowls. You’re having to constantly worry about whether this pseudo-scizophrenic teacher is going to snap. Creating a smiling default makes it more clear to students what behavior is socially acceptable in our classroom and what behavior is not. In my experience, after developing a smiling default, my students know quickly when they’ve disrupted a social expectation. I’ve had many a moment in which my students knew as soon as they walked in whether the sub report was good or bad. For those who think, “I don’t smile. It’s not natural for me. I’m not going to be someone I’m not,” consider this. You were actually born joyful. It was who you were as a person – joyful, smiley, full of laughter. By smiling, you are cultivating who you used to be. So, cheese it up and bring a smile back to your life, your teaching, and your students’ learning. Chase Mielke is a learning junk ie who happens to have a love affair with teaching. A book addict by night and a teacher and instructional coach by day, he fantasizes about old libraries and fresh Expo Markers. His obsessions with psychology, well-being, and cognition often live on his blog, affectiveliving.wordpress.com.